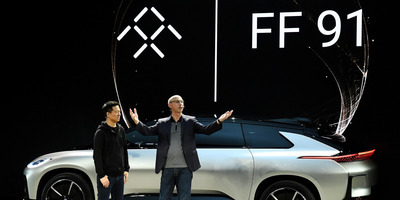 Ethan Miller/Getty Images)Faraday Future CEO Jia Yueting (left). A new, Hong Kong-based investor has promised a $US1.5 billion infusion – $US550 million of which is already in the bank, a source familiar with the company’s business dealings told Business Insider. Lingering challenges are still on the horizon as Chinese regulators pursue Faraday Future’s top executive, Jia Yueting, over hundreds of millions in unpaid debt. More than two years after it first emerged from stealth mode and pitched itself as a “Tesla-killer,” Faraday Future is best known not for making high-tech, 1,000-horsepower electric cars. Instead, the unpaid bills, lawsuits, an employee exodus, and public bickering with former executives have defined what had once been a potentially exciting new challenger in the race to build the next great electric-car company. Faraday Future’s top backer, Jia Yueting, drew his line in the sand early, in spring 2016, when he said “We hope to surpass Tesla and lead the industry leapfrogging to a new age” in an interview with Reuters. He was talking about Faraday Future, just four months after a lacklustre debut at the Consumer Electronics Show in Las Vegas. That month, the company had hosted a well-attended ceremonial groundbreaking for its proposed factory in North Las Vegas. Today, North Las Vegas is on an indefinite hold, and Faraday has been drowning in debt in the US, while Jia, the company’s founder and chief executive is also being pursued by Chinese regulators for hundreds millions of dollars in unpaid debts tied to his companies there. Now Faraday is hoping to turn the page on a tumultuous couple of years. With new cash on hand and plans to start fresh, the company is hosting a suppliers’ summit at its Los Angeles-area headquarters to show it’s not giving up just yet. A number of suppliers are expected to attend the gathering, including Bosch, LG Chem, Fuji Technical & Miyazu, Velodyne among others. “Our goal was for suppliers to walk away with renewed confidence about our plans and our funding,” Faraday’s head of supply chain Pablo Ucar said in a press release. According to a source with knowledge of Faraday Future’s business dealings, the company has secured about $US1.5 billion in new investment. The source did not reveal the investor’s identity, saying only that it is a Hong Kong-based entity. Faraday received $US550 million of that investment so far. About $US300 million arrived in early December, according to the source. Another $US250 million was received earlier this month. Receipt of the remaining $US950 million is contingent on as-yet-undisclosed project milestones. Faraday has had a rough time trying to keep its bank accounts from drying up over the past year. That struggle reached a critical point as far back as January 2017, when former executives told Business Insider that Faraday was just weeks away from bankruptcy. Those bankruptcy rumours resurfaced last fall. Last spring, the company brought on former BMW exec, Stefan Krause as chief financial officer. Krause launched a worldwide blitz to raise $US1 billion in cash for Faraday. It was mostly unsuccessful, and Krause left the company to open his own electric-car startup, prompting an intellectual-property lawsuit. 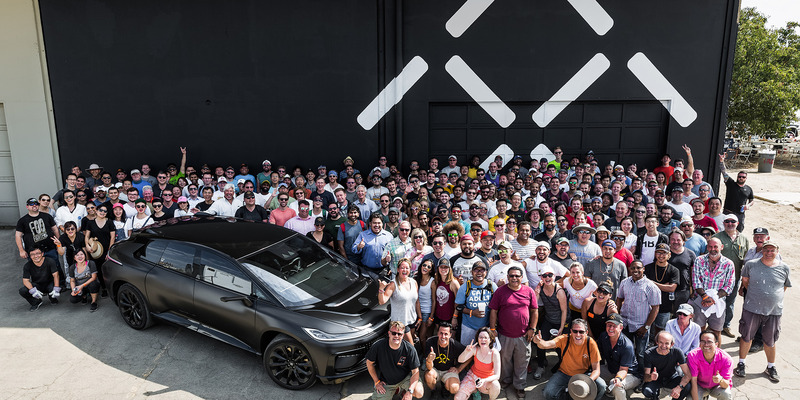 Faraday FutureAttendees pose with the Faraday Future FF91 electric vehicle at its new manufacturing facility in Hanford, CA. Hanford wasn’t Faraday’s first choice. Its stalled assembly plant project in North Las Vegas was all but abandoned after it missed millions of dollars in payments to AECOM, its construction partner at the time, and work at the site was halted. “We are well into the process of design and permitting, and have begun planning our recruitment cadence,” Faraday’s global manufacturing exec Dag Reckhorn said, according to a company press release. “As of February 1st, the property has been completely vacated, so we will move forward on construction and equipment by the end of the quarter,” Reckhorn said. A portion of the presentation Reckhorn gave to suppliers on Tuesday that was seen by Business Insider proposes the Hanford factory will be up and running by December 2018. Faraday has made many promises about the FF91’s production timeline, and given that prototypes have yet to reach critical development milestones like physical crash-testing, it is not entirely certain whether the company can pull it off. For now, Faraday seems undeterred. A source with knowledge of the company’s product timeline says it even plans to launch a second vehicle, the FF81, for the Chinese mass-market. The source describes the FF81 as a smaller version of the FF91 – a vehicle expected to carry a six-figure price tag. It’s not yet clear how much the FF81 will cost, but an official unveiling is expected to happen at an upcoming showcase in Beijing. For a company like Faraday Future that has had countless false starts, multiple scandals, mountains of debt, and little more to show for its work other than breathless self-promotion, you would be forgiven for expressing some healthy scepticism about the company’s latest survival pitch. But Jia Yueting and a handful of the company’s most loyal believers remain committed as ever, for better or worse.